We’ve all been guessing it was going to happen for months, but that doesn’t make it any more fun when it actually does: data caps are marching across the nation, and coming for millions of Comcast customers from coast to coast. The caps (they gave up on “thresholds“) have been slowly spreading across new cities for years, and in a blog post today, Comcast confirmed that it’s bringing “data plans” (read as: broadband service limits) to “many markets” nationwide. Users who go over the limit of 1 TB of data used in a billing cycle will get a stern warning. Customers get two “courtesy months” in a year without being billed for overage. After that, it’s overage charges, much like a traditional wireless plan. Your service won’t be cut off or throttled; you’ll just suddenly see extra charges on your next bill. The full list of states and metro areas now subject to the cap is a few scrolls down in Comcast’s updated FAQ, and you can check at Comcast’s dedicated “data plan” site to see if the ZIP code where you live is subject to a cap or not. Comcast is emailing customers in affected markets to let them know about the change, which goes into effect at the beginning of next month. Consumerist readers in several metro areas, including Detroit, Houston, Indianapolis, Minneapolis-St. Paul, and Sacramento forwarded their Comcast emails to us. 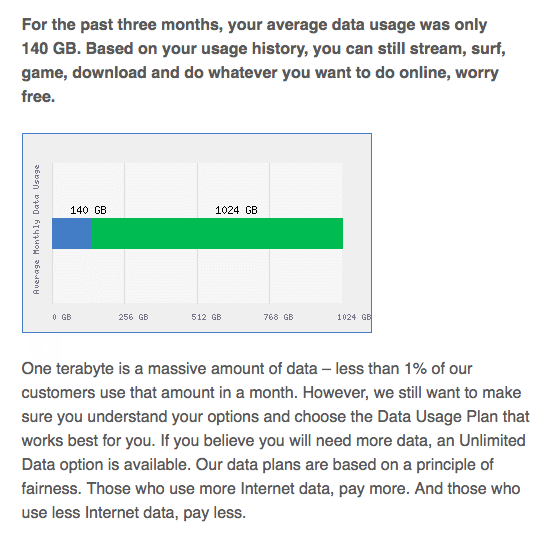 Comcast is, of course, cheerfully praising the generosity of its 1 terabyte limit, without actually mentioning that it’s not really necessary to impose such a limit on most customers at all. 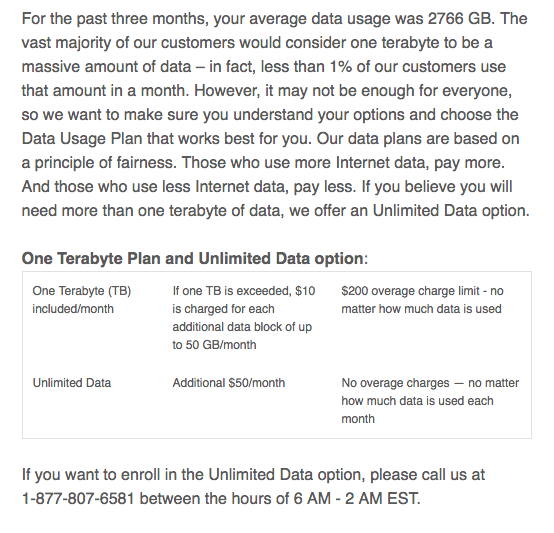 If it’s true that “more than 99% of [Comcast’s] customers do not use 1 TB of data in a given month,” why cap at all? After all, the company has admitted before that data caps are not actually a network or congestion-management tool, and surely there’s a limit on how much extra revenue they can extract from that remaining 1%. And yet that is not, in fact, true. If 99% of their customers, as they claim, use less than 1 TB of data per month, then those who use less are not paying less. Those who use less — everyone but the one-percenters, as it were — are all paying the same, without an opportunity or method to reduce their bills. Several readers who forwarded their letters from Comcast to us also expressed concern about Comcast’s ability accurately to meter their usage. As we’ve seen several times before, Comcast’s usage meters are far from infallible, and when something goes wrong there’s basically no recourse for consumers. One high-usage customer shared with us his usage graph of 3270-3360 GB per month over the past several months, and wondered how Comcast turned that into an average of 2766 GB in the letter they sent him. “I’m not sure what kinda math they use,” he told us, although admittedly their confusion is in his favor. And unfortunately, that answer continues to be: basically nothing.